“No entry”. I drove around the bay to the next access point and it was fenced off with a barbed wire barrier that would stop a zombie brigade. My heart sank. 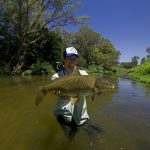 I had been fishing Theewaterskloof Dam’s shoreline for more than two decades and had to wave goodbye to some of my favourite and best carp hunting grounds because of paranoid farmers that beefed up security. I guess one can’t blame them under our country’s circumstances. I left the Riviersonderend catchment and decided to take a detour through the Breede River Valley and look for other state and farm dams on my way home. En route, to my surprise, I found a Jeep track to Quaggaskloof Dam and an area of the water body that I had never visited before. It was a piece of heaven. Largemouth bass, catfish, banded tilapia and carp were spawning in grass that got flooded by clear water, almost identical to my old Theewaters honey holes. I fished it hard, returning every week for a month to brilliant sight fishing for freshwater sportfishes. For two years my attention had been drawn away from dam fish to the Atlantic Ocean due to access issues. 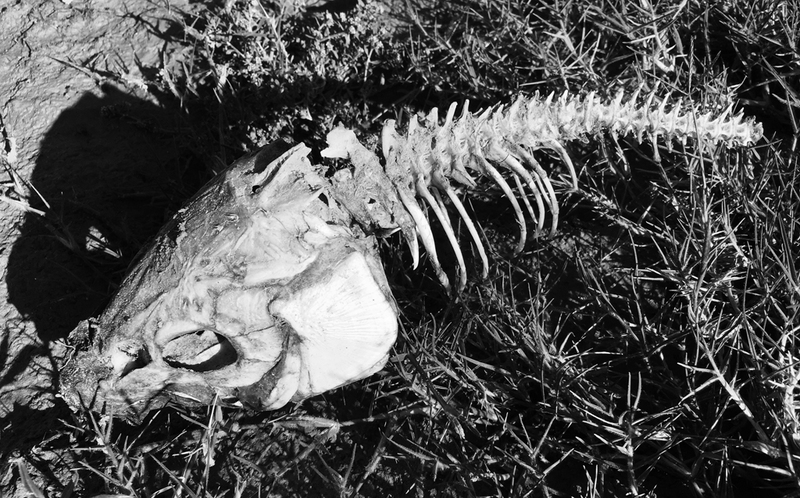 The saltwater fishing was good, but it felt like a little piece of my soul had died. 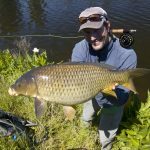 I simply couldn’t stop thinking about hunting carp in the shallow water – my favourite type of fishing. Falling around between unproductive banks spotted on Google Earth, ‘once-off’ access to private waters (even at whisky distillers) and unsubstantiated tip-offs from others I started believing my stillwater carp trips were history. 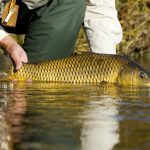 It’s not easy to find these places and not all shallow water areas are good; sophisticated fish are selective when picking a cafeteria for dining. Then, by chance, Conrad more recently reminded me about an area near Worcester where we used to catch bass in the art lure days. Conrad, being a bass man, had dialled in on the bass fishing with fly tackle at this spot, but the stories and photographs of biggish witvis he shared with us really grabbed my attention and convinced me to check it out with my fly rod. When I got there it wasn’t so much the bass haunt that got me excited, it was the grassy shallows teaming with catfish and carp that lured me back. This year it was the best I had ever come across. Ironically, in one of the most unlikely areas, the drought promoted grass and shrubs to grow across the vast exposed dam-bottom and the carp had selected this as their ‘coenatio rotunda’ when dam levels increased. I guess one should never give up and even scratch in corners where fish are least expected. It was also a reminder that many years of experience on fishing for a particular fish doesn’t necessarily mean that much knowledge is carried about that fish. One of the prettiest mirrors I’ve caught and ironically thanks to Conrad’s bass addiction pointing me to a new spot.